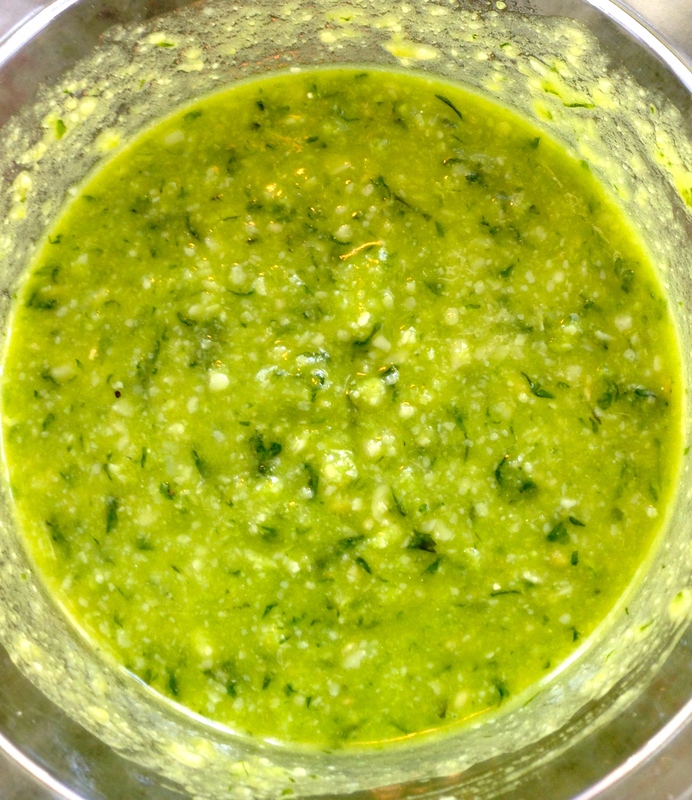 So I will start with a very easy, no-cook recipe: Pesto. I have this app on my iPhone called Foodgawker, which is sort of like Pinterest but just food – I found this recipe there. We had some basil in the backyard that needed to get used up, so it inspired me to search some pesto recipes, and this one looked like the best. I have to say, it was awesome and easy – I used a mortar and pestle, which was a ton of fun, but I’m sure a food processor or blender would also work. I ended up doubling this recipe, but do whatever you want. Put the garlic and salt into the mortar and crush until creamy. Add the basil leaves and crush. I learned that if you turn the mortar and the pestle in opposite directions, the whole process goes much faster. Try to get it to a paste, but you’ll be crushing it more later, so don’t worry too much. Now add the pine nuts and crush until it’s pretty homogenous. Start adding in the cheeses, a little bit at a time, until everything is all mashed up. The last step is to add the olive oil. 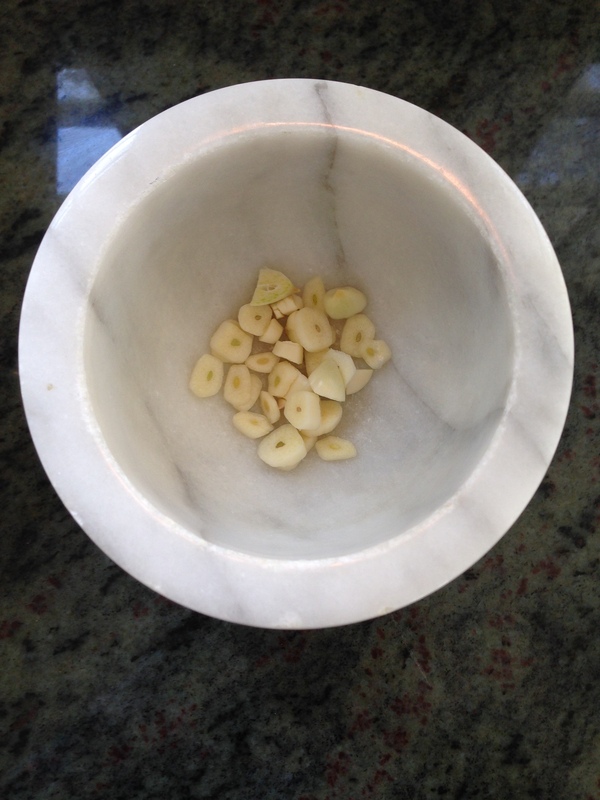 You can either use the mortar and pestle for this, or if your mortar is too full you can move the paste to a bowl and mix in the olive oil with a spoon. The pesto will keep for about a week, if you can hold onto it that long – it’s a crowd favorite. It also keeps frozen for a few months. Throw it in with some noodles, add it to a sandwich, or just eat it straight from the bowl – no judgin’. 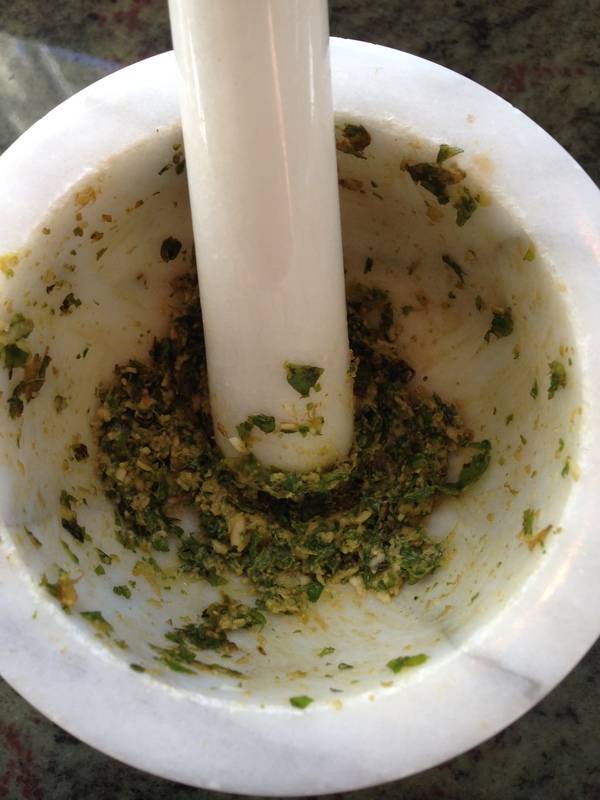 This entry was posted in Noms and tagged Foodgawker, Mortar and pestle, Pesto. Bookmark the permalink. Thank you Jillian!! Is FoodInBoston your blog? I LOVE it!! Everything looks delicious!